Think of your lawn not just as a blank green carpet, but composed of thousands of separate plants. The organic lawn can feed birds and insects, as well as hosting flowers. And you can still mow, sit or play on it – without using unnecessary and expensive chemicals. Bent grasses – these spread by their long creeping stems, which extend over the surface of the soil. The joints (nodes) of these stems take root very easily, to form the thick, velvety turf often used on high maintenance lawns such as golf courses. Clover – it’s not a grass, but it does lock nitrogen into the soil, which is a natural fertiliser. The flowers feed the bees, and it keeps the lawn looking green during a drought. Use a dwarf variety with small leaves. In spring, gently rake the grass with a spring-tined rake, taking care not to tear it. This removes winter debris and lifts grass and weed foliage for efficient cutting. Leave a pile to one side, for the birds to use to build their nests. Once the soil is warm, sow bare patches. Fork the soil to break it up, then firm and level it before applying an appropriate grass seed. Cover with fleece or polythene to keep the birds off and water regularly. Your first cut should not be too short. Especially if a sunny day leads to a night time frost. Throughout summer, leave the clippings every so often. 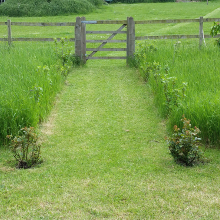 As they decompose they release nitrogen, providing up to 30 per cent of the lawn's required nutrients, especially if you have clover growing amongst the grass. If cuttings are long, add them to the compost heap (alternating with layers of brown stuff, such as straw, paper, or cardboard, otherwise they go soggy.) Or use them as a mulch over damp soil around trees, fruit, vegetables and flowers. Discourage perennial weeds by digging them out regularly with a narrow trowel. In autumn, continue to aerate the soil to prevent moss. See Troubleshooting below. Weeds – remove roots of individual weeds like daisies, plantains and dandelions with a knife. Fill hole with light soil, and re-sow grass seed. Avoid mowing too low as this can weaken the grass and enable weeds to invade. Ants – ants are virtually impossible to eradicate, and though they might not be harming the lawn, they can cause unsightly nests. Drown them with water. Moles - mole hills can be unsightly in a lawn, and make mowing difficult. There are ways of trapping moles humanely (probably best left to professionals) but you can also deter them from creating their tunnels in various ways such as flooding, noise, vibration, the smell of human urine, barriers and even digging them out. Spurge (Euphorbia) can also repel moles. Mole hills are made of a very fine-textured, friable soil. Use it to make potting composts. Leatherjackets – These are the larvae of the crane fly (daddy-long-legs) and they create yellowing patches on lawns in dry summer (you often see starlings or woodpeckers probing for them). You can trap them by watering yellow patches then covering them overnight with sacking or tarpaulin. The larvae will come to the surface, under the covering, allowing you to pick them off in the morning. Or just enjoy the sight of a handsome green woodpecker in your garden!